Work continues on. We fly for a little, then we crawl, then we fly, and walk, and crawl. Such is construction! After the first wall pour, we stacked pretty quickly up to the tops of the window and door bucks, although now the crew has to thread each and every block over varying-height, tall pieces of rebar. 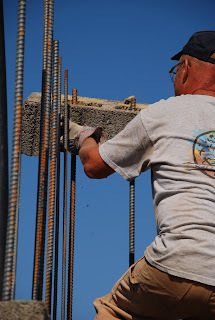 And once we got the the course above the plethora of windows on the south side, we needed extra rebar reinforcement, to make sure the eventual concrete lintels will be strong enough to hold everything up, and so each block needed to be customized to allow extra reinforcement. At that point, we were hoping for wall pour # 2 sometime this week, but then we ran out of block, and tried to get it shipped, but couldn't get it until Thursday of this week. So the pour will be next week. So now we find ourselves having a little bit of a break. Drew is outside today trying to get his new (used) baler running. As I sat here typing, I heard the motor fire up for the first time. Our neighbor had it in his barn but hadn't used it in many years. But it looks like we can bale up some straw from our incredible stand of the dry, waving grass for use in the garden this winter. Also, dear friends are coming to visit tomorrow, and they're staying through the weekend, while one is visiting right now! What a full life, and what fullness summer brings.